Heirloom tomatoes. They are so pricey, but so worth it, right? My favourite place to buy them is Klippers Organic’s stall at the Vancouver Farmers Markets. I could stand at there forever, oogling the rainbow of colours and taking my sweet time choosing the perfect ones. 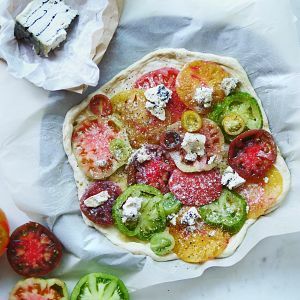 This simple pizza is one of my favourite heirloom tomato recipes. 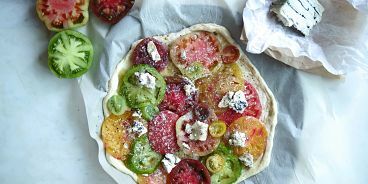 Scroll down for details and a few tips on how to make pizza night even easier (if you’re having one of those nights and want to simplify your routine!). Preheat oven to 400F and roll out your pizza dough as thin as possible. Transfer to a parchment lined pizza pan. Drizzle dough with a generous amount of good olive oil and spread it over the whole pie with your hands. Next, rub minced garlic all over your dough’s surface, sprinkle with parm cheese, salt and pepper. Slice tomatoes and load them up onto your pizza. Sprinkle with more salt and pepper, parm cheese and olive oil. Add small handfuls of Joey’s Nut Cheese all over pizza. Bake at 400F for about 15 min or until crust is slightly golden. Be careful to not overcook — I’d say slightly under-baking pizza is one of the tricks to a perfect pie. Enjoy!